Discover the 36-card Lenormand deck via this 64-slide visual feast (less than a slide-a-minute) that covers the history, variety of decks and a brief overview of reading methods and traditions. What’s so special about the Lenormand deck? Where did it come from? What does Mlle. Lenormand have to do with it? How is this deck different than or similar to Tarot? What can it do for me and how do I read with it? Learn how the Lenormand cards clued me into something that saved a trip from certain disaster. 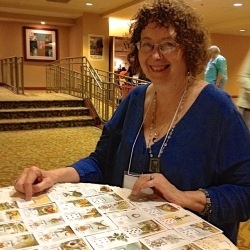 Mary K. Greer has been exploring the Lenormand deck and traditions since 2007 and is totally captivated by its charm and accuracy. Discover what the hoopla is all about and get a look at these 212+ year old cards that have exploded onto the divinatory scene in the last three years. Join her as she explores one of the most practical and precise divinatory tools in existence.